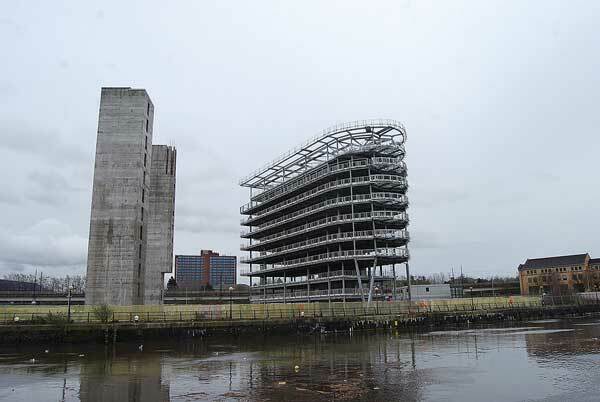 Elland Steel Structures has completed the steelwork for the first block for a new residential scheme beside the Manchester Ship Canal. Known as Manchester Waters, the project will help regenerate Pomona island, a strip of land adjacent to the Canal, which has been identified as a new destination for business, residential and leisure by the local authority. It is being developed by X1 with Liverpool-based Vermont Construction as main contractor. In total, the scheme is set to deliver five blocks in two phases, with the first two blocks (phase one) due to be complete by early next year. The initial two steel-framed blocks are 10-storeys and 12-storeys high and will contain a total of 216 apartments. These will be a mix of studio, one, two and three-bed units. The planned second phase will consist of three blocks of 15-storeys, 17-storeys and 19-storeys that will bring a further 526 new homes to the market.